daily dose of spazz: Working at Home...I'm Lovin' It! Working at Home...I'm Lovin' It! The passover holidays combined with recent construction in my new office has given me a chance to work at home a few days and I am loving it. It couldn't have come at a better time either. I got all my swaps done and mailed off today, yay! I have kept the house pretty darn clean for days in a row with a kid in the house, no easy feat! And I got to see Martha two whole days in a row, unfortunately she has not been very crafty the past couple days. I LOVE working at home, especially this morning when the weather was not very kind for drivers or commuters. I also made my way out to the mall briefly today after the post office to return something before my 30 days expired, tomorrow. I was so happy to see that I can now buy some Bling for my teefs at a kiosk in the mall. That's right! You can now buy yourself a *grill* in the middle of the Harlem Irving Plaza. I wanted to get a little closer to inspect them and get a photo, but I knew that I would be attacked by the high pressure kiosk sales clerk and I just didn't want to deal with her through my hysterical laughing. Yes, my girl, Greta, is absolutely 100% correct...I am my very worst critic. I had cards done for this SCS Blogger Only Swap I joined a million years ago last week and just didn't think they were of the high caliber that they should have been. 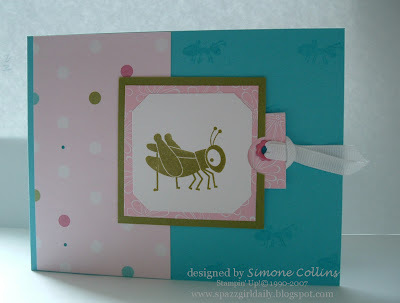 So I sent them out to some other bloggers and made all new cards. This is the original swap card. 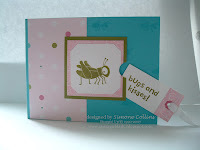 The little bug is from Bugs and Kisses and I can't get enough of that patterned paper, I am on my second pack and it is almost gone, again! But it just needed more and I really didn't want to deal with the glitter again, I just got done sparkling from the last time I pulled it out. Tomorrow....details on the new swaps. Love it! What a cutie card? I didn't realize for some silly reason that you are from Chicago! Me too! Cute card...the grill...not so cute! I saw those on "The Girl's Nextdoor" and thought whatevah. Can't believe the mall kiosks are selling those...too funny! Ms. Simone you are one crazy girl. The card is wonderful and quite worthy of a swap. Why do you think it had to be re-done? Wow, we can get tooth bling at the HIP, I am so there this weekend, gotta look good for the summer!! LOL!!! I love all of your cards! Once I get my cards on my blog, I'll ask you to be my blog friend! BTW, found you on SCS!